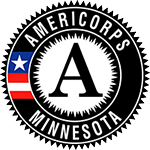 Santhi Sheehan is an AmeriCorps VISTA at Northfield High School’s TORCH office. The TORCH (Tackling Obstacles and Raising College Hopes) program is part of Northfield’s Healthy Community Initiative. 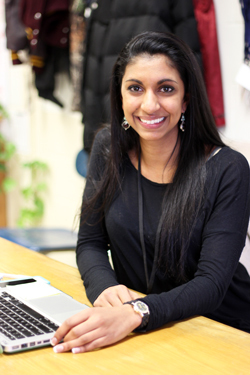 Santhi is the third SMIF AmeriCorps VISTA to have held this position. The results of Santhi’s efforts and those of the TORCH program are showing impressive results. “Of the 35 students I’ve been working with who are enrolled in PSEO courses, 31 have earned a collective 145 college credits. This is a total of $130,000 saved that they’d otherwise have to pay out-of-pocket if they took these courses after they graduated,” said Santhi. The TORCH office works with about 500 of the almost 1,250 students at Northfield High School. It is a model of collaboration, with Riverland Community College offering the PSEO courses, Carleton College providing teaching assistants to the high schoolers, and TORCH assistants like Santhi making sure the students are getting the support they need to succeed. SMIF offers a variety of AmeriCorps VISTA positions as part of its mission to support economic development in its 20-county region. The focus of the VISTA members is on work in the area of Economic Opportunity, enabling individuals to obtain or train for gainful employment. VISTA members serve in 501(c) nonprofit organizations; educational institutions; faith-based organizations; tribal, state, and local government agencies to build organizational capacity for conducting anti-poverty work. Applications are accepted annually in November. Individuals interested in this program may contact Pam Bishop, VP of Economic Development, at 507-455-3215 or pamb@smifoundation.org.